No 6 lies at the northern end of Cross Street, c.50m to the south of the boundary of Hoxne Priory, on the east side of the road. The property is attached to, and listed with, Athene Cottage, both formerly being part of one house dating to the mid 17th century (NHLE No. 1032504). No 6 includes a 19th century extension on its north side. The plot appears to be shown as an open field named 'Hemplands' by Skynner, although it is possible that the property lies just to the north outside of Lord Maynards estates. The property is clearly shown on the Tithe map (named in the apportionment as 'Cottage and Gardens' owned by Samuel Thrower) and the cottages are shown as separate properties on the 1st Edition OS. 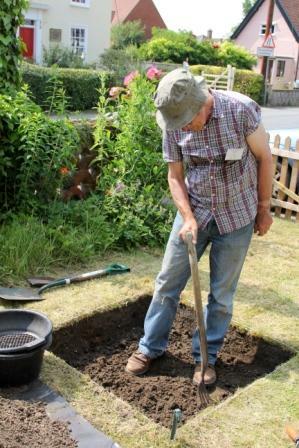 The test pit was placed in the small front garden, c.1.5m from the road frontage. A modern topsoil, Contexts 1 and 2, ranging from 0.3m to 0.4m thick, sealed a 0.15m thick layer of grey/brown loam with densely packed flint and brick/tile fragments, Context 3. A large void, possibly an old animal run, was seen in the southern section of the pit through this deposit and the underlying layers. Context 3 sealed Context 4, a c.0.2m-0.3m thick brown clay loam with yellow clay and then Context 5, a c.0.1m thick deposit of dense flint in a clay matrix with fragments of brick. A grey clay, thought to be the natural subsoil was exposed at a depth of 0.7m-0.8m. A single fragment of MCW was collected from Context 5 (L12th-14th century). Other pottery identified from this pit consisted of LMT (15th-16th century), GRE including the handle of a pipkin or skillet and IGBW (16th-18th century). Two sherds of Rhenish stoneware of Frechen type dating from 1550-1700 were also identified from Context 5. The two upper contexts also contained Victorian and later pottery. 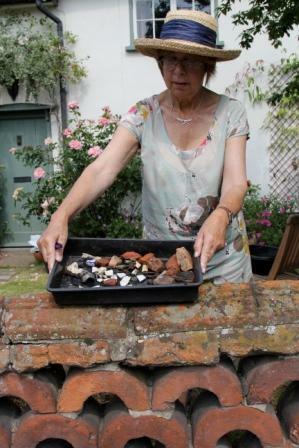 A range of other post-medieval artefacts such as ceramic building material, clay tobacco pipe and glass were also present, and a large quantity of animal bone and oyster shell from Context 5. As with Test Pit 22, excavation showed a thick modern topsoil containing material likely deriving from the more recent occupation of the property. Context 3 may represent a former yard surface or foundation but is probably 19th century in date. Context 4 is likely to be a preserved soil horizon, broadly contemporary perhaps with the construction and early occupation of the property, with Context 5 possibly being an earlier yard surface. A single sherd of medieval pottery hints at activity in the area contemporary with the Priory while the large relatively large quantity of animal bone could be an indication of a specific function, namely butchery, for the plot rather than just domestic rubbish.